Two from recent themes – Fancy Dress, and Tiny Houses. Still smack in the middle of busy season at work so less energy for art. Arrrgh! Hello to Paint Party Friday! Thanks for dropping in! 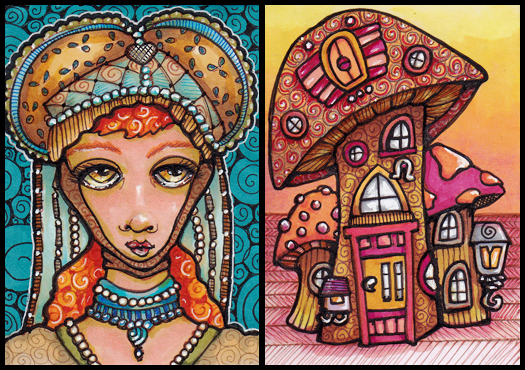 This entry was posted in ATCs and ACEOs, Copic Markers, Elaborate Costume, Paint Party Friday, Progression Photos on July 25, 2014 by The Beast Tender. I love your style of artwork such great illustrations and beautiful vibrant colours. I love looking over all the fine details in your art-marvelous style! Brilliant mushroom houses!! Love them!! Royalty and the home of a duchess, or an astral gnome:) Love the blues against Gwen’s red hair! Love both pieces but Fancy Maiden really is my fav ♥ Summer is always a challenge for me to find art time. oh my gosh such beautiful details, amazing wok!! ooops, I missed the r, lol sorry, I meant WORK!!! I love all the steps!! Woohoo! I am so glad you are still drawn back to fancy maidens, because you do the best fancy! All the best fancy! Her headdress is magnificent! Okay, remember that game I was talking about where I try to find all the changes you’ve made from one progress pic to the next? I cannot find the difference(s) between the penultimate fancy maiden progress pic and the final one. HELP ME, OBI WAN KEFANCY! What did you add? (gasp) I adore your artwork. The detail, grace, simplicity and the gorgeous colors you used, just fill my eyes–which is the greatest compliment I can give. Your art is so exciting. The whimsy is fabulous. The mushroom house is very cute. I like the reds and browns. Cindy, great color palette for the two illustrations. I always like the design on your Renaissance inspired costumes. I like those vibrant colors on the mushroom house! Ms. Gwen is looking a bit depressed. What’s the cause of her woe? You are the copic queen, Cindy. Thank you! She is undoubtedly exasperated by her required presence at a society event of one sort or the other. Of course she would rather be walking in the woods with her hounds! OH my gosh…..I had not seen this post……the mushroom house is adorable……you’ve got some gorgeous pinks and magentas in there……contrasts nicely w red maiden…..love!